The T110E5 is an American tier 10 heavy tank. This tank has high penetration and relatively quick reload in exchange for a lower single-shot damage compared to many traditional heavy tanks. The T110E5 is a relatively quick heavy with good gun handling characteristics and alternating strong/weak armor zones, allowing it to force other tanks to react its actions when driven well. The T110 is something of a blend of heavy and medium characteristics, allowing it to fill almost any role on the field and perform well, but making it less specialized for specific roles compared to many other tier X tanks. The T110E5 retains the 'eggshell' style of front hull armor layout from the M103 and has greater protection in the areas of high thickness both in the hull and the turret. There is little increase in effective protection in the previously thin areas such as the lower plate however. The T110E5 also had a prominent commander's cupola that invited shells from opposing players. However, such an obvious target was a boon as much as a liability in the hands of a player familiar with baiting and misdirecting cupola shots by opponents; the cupola was more heavily armored than most US cupolas and could surprise many an opponent looking for a quick shot. The cupola was then nerfed, by replacing the cupola that previously was like the ones found on the other T110 series cupolas with a weaker, smooth cupola. Now it has been mostly removed, and is now a very small but soft weakspot that is hard to hit. The T110E5 marks the end of the American heavy line. With respectable frontal armor and an excellent gun, the combination of mobility, protection and firepower makes the T110E5 possibly the most versatile tank in the game. As is with its predecessor, the E5 is best used as a second line support tank as its weak spots become very easy to hit once up close. However it is more than capable of holding its ground in a brawl in the hands of a skilled player that understands and utilizes angling and distraction techniques. The good mobility helps the tank keep pace with most medium tanks, rather than lag behind like other heavy tanks. Dubbed the "Medium-tank Hunter", the excellent maneuverability allows the tank to prevent from being circled by mediums. Supporting the mediums will give teammates a good advantage over the enemy. The good mobility also enables the T110E5 to change positions fairly quickly. The 120mm gun has a good Rate of Fire, giving the T110E5 a major boost in terms of DPM compared to other heavy tanks. The good gun statistics may surprise your enemy, and utilizing the tough frontal armor will help delay the enemy enough for the rest of the team to arrive. 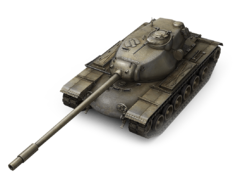 Gun depression is also good at -8, allowing the T110E5 to work ridge lines and hilly terrain. The cupola weakspot can be protected by raising the gun to block it or shaking the turret from side to side. Moving back and forth helps as well. This page was last modified on 14 April 2018, at 08:45.